Having established a direct relationship between nutritional status and physical work capacity in undernourished men, attention can now be directed towards the association between VO2 max and productivity. The amount of work done in terms of output of a product is usually difficult to measure, particularly in the lighter work task where the intellectual component may have as much or more to do with "productivity" as the physical use of one's body. In moderate and heavy work, it has sometimes been possible to estimate productivity by measuring the quantity of product, or income where piece-work is the basis for payment of the worker. Sugar-cane cutting and loading are heavy work tasks where the weight of cane cut or loaded is measured carefully since workers are usually paid by the tonnage cut. Because the pay-scale in many sugar harvesting operations is very low, one might expect that the motivation factor would be fairly similar in different groups of workers and that they would work close to the limit of their physical capacities. Also, logging is heavy physical work (DURNIN and PASSMORE, 1967) and has been used to relate productivity to worker characteristics. The time to accomplish standard work tasks is another method which has been utilized to estimate productivity (VITERI and TORÚN, 1975). HANSSON (1965) measured submaximal work and estimated VO2 max in a group of "top" producing lumberjacks and a group of average producers, and found that the former had a higher estimated VO2 max than the latter. DAVIES (1973) studied sugarcane cutters in East Africa, dividing them into high, medium and low producers based on the daily tonnage cut. He found no difference in the three groups in height, weight, summed skinfolds, LBM, leg volume or the circumferences of biceps and calf, but did encounter a significant correlation between daily productivity and VO2 max (r=0.46; p<0.001). DAVIES et al. 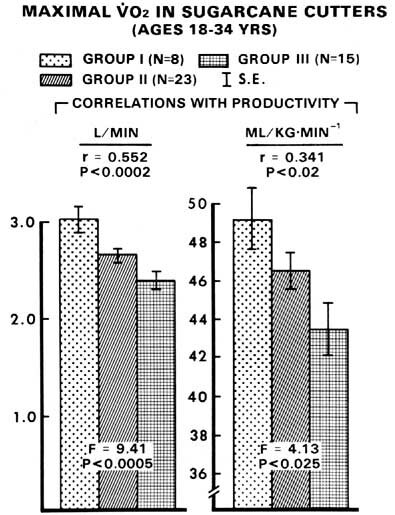 (1976) also measured productivity in Sudanese cane cutters during a 3-hour period of continuous cutting and reported a significant correlation between VO2 max and rate (kg/min) of cane cutting (r=0.26; p<0.01). The VO2 max and body fat are influenced by present nutritional status (VITERI, 1971; BARAC-NIETO, et al., 1978) and adult height by past nutritional status during the period of growth (MARTORELL, 1985). Equation 2 states simply that those who are presently in poor physical condition or malnourished (low VO2 max) or whose height is stunted because of past undernutrition, are at a disadvantage in terms of ability to produce in cutting sugar cane. The negative coefficient for % body fat indicates that there is some advantage to low body fat contents. The relatively low correlation coefficients between productivity and VO2 max obtained in our studies (Figure 5) and those of others (DAVIES, 1976; SPURR, BARAC-NIETO and MAKSUD, 1977) preclude the use of regression equations in the prediction of productivity and bring into question the homogeneity of motivation alluded to above. The results shown in Figure 5 indicate that the more physically fit subjects were better producers. Also, since malnutrition reduces VO2 max. one can predict that it will have proportional effects on productivity in hard work. Figure 5. VO2 max and maximal aerobic power of good (Group I), average (Group (II), and poor (Group III) sugar-cane cutters. F ratio values are from a one-way analysis of variance (SPURR et al., 1977). Even in the case of the sugar-cane loaders, who do not work continuously, productivity was positively correlated with maximal aerobic power and negatively with resting and working heart rate, demonstrating again the relationship of productivity to the physical condition of the worker (SPURR, MAKSUD and BARAC-NIETO, 1977). In the case of sugar-cane cutting which, at an average expenditure of 5 kcal/min per 65 kg of body weight during the 8-hour workday (SPURR, BARAC-NIETO and MAKSUD, 1975) can be classified as moderate industrial work (DURNIN and PASSMORE, 1967), the worker's productivity is related to his body size, height, weight and LBM (DAVIES et al., 1976). This has also been demonstrated by SATYANARAYANA et al. (1977; 1978) for industrial factory work of presumably less intensity than sugar-cane cutting. Their subjects were nutritionally normal workers engaged in the production of detonator fuses which could be measured in terms of the number of fuses produced per day. They found that body weight, height and LBM were significantly correlated with productivity and that, after partialling out the effect of height, weight and LBM were still significantly correlated with productivity. That is, the total daily work output was significantly higher in those with higher body weight and LBM. There also appears to be a relationship between the intensity of a work task and physical work capacity of the worker (CHAFFIN and DEARAUJO COUTO, 1986). Subjects engaged in tasks at various intensities show a positive and significant correlation (r=0.84) of VO2 max. as estimated for submaximal bicycle ergometry, with the energy cost of the worker's job. One does not know, however, if this is a cause-effect relationship. Does the VO2 max increase as a training effect of prolonged intensive work or are these results a matter of some sort of selection such that individuals with higher natural work capacity choose heavier work (ÅSTRAND and RODAHL, 1970)? Since the reduced work capacity found in malnourished adults was largely the result of reduced muscle mass, the effect of chronic marginal malnutrition, which is so prevalent in the poorer segments of developing countries, on the growth of work capacity in school-aged children was then examined. Most of the studies of exercise and work capacity in malnourished children have been carried out using submaximal exercise testing. ARESKOG et al. (1969) determined the physical work capacity at a heart rate of 170 (PWC170) in 10 and 13-year-old Ethiopian boys from public and private schools with the aim of including both poorly nourished (public school) and well-nourished (private school) subjects. The older public school boys were shorter, weighed less, and had smaller skinfolds and mid-arm circumferences than the private school subjects. The performance of the public school boys was somewhat better than the private school children in the tests of PWC170. DAVIES (1973) predicted VO2 max from submaximal bicycle ergometry, demonstrating that malnourished (underweight) children had low values for VO2 max. but that maximal aerobic power expressed per unit of body weight, LBM or leg volume were well within the normal range. SATYANARAYANA et al. (1979) have also reported the results of measurements of PWC170 in boys 14-17 years of age, categorized according to their nutritional status at age 5 years. They found that about 64% of the variation in PWC170 could be explained by the subjects' body weight at the time of the testing, and another 10% by their habitual physical activity levels. But even severe malnutrition at age 5 had no effect on work performance when they expressed PWC170 in terms of body weight. However, the undernourished subjects had higher heart rate values at the same submaximal workload, i.e., were working at a higher % VO2 max than normal children. In the work from our laboratory, all subjects were boys who had to present their official birth certificates as a first condition for inclusion in the study. They were grouped into five age-groups at 2-year intervals from 6 to 16 years of age. Using the Colombian standards established by RUEDA-WILLIAMSON et al. (1969), children were selected who had weight-for-age and weight-for-height >95% (but <110%) of predicted as being nutritionally normal and without a history of undernutrition. Those with both weight-forage and weight-for-height <95% of the standard were considered to be undernourished at the time of study. The reason for choosing 95% as the cut-off point was entirely arbitrary with the expectation that the group averages would be considerably below this point (SPURR, REINA and BARAC-NIETO, 1983). The details of the selection process and the methodology employed in the anthropometric and maturation (SPURR, REINA and BARAC-NIETO, 1983), VO2 max (SPURR, et al., 1983), body composition (BARAC-NIETO, SPURR and REINA, 1984) and work efficiency measurements (SPURR et al., 1984) have been described in detail elsewhere. The average heights and weights of the five age-groups of nutritionally normal and undernourished boys are plotted on the U.S. NCHS percentile grids in Figure 6. The number of subjects in each group varied from 24 to 60. The nutritionally normal boys followed the 50th percentile in the younger age groups and deviated towards the 25th percentile in the older groups (Figure 6) for both height and weight. The tendency towards shorter stature in these boys is probably the result of the high percentage of mestizos (74%) who have shorter stature than other children (MALINA, 1973; ZAVALETA and MALINA, 1980). Both height-for-age and weight-for-age of the undernourished boys were on or below the 5th percentile during this period of growth. The weight-for-height of the normal subjects were slightly above the 50th percentile throughout this period, while the undernourished boys followed approximately the 10th percentile (SPURR, REINA and BARAC-NIETO, 1983). In addition to the depressed growth pattern seen in Figure 6, the undernourished subjects had significantly lower values for skinfolds, a significantly delayed growth spurt and sexual maturation (SPURR, REINA and BARAC-NIETO, 1983) and, in a subgroup, increased fasting levels of circulating growth hormone (SPURR and REINA, unpublished). 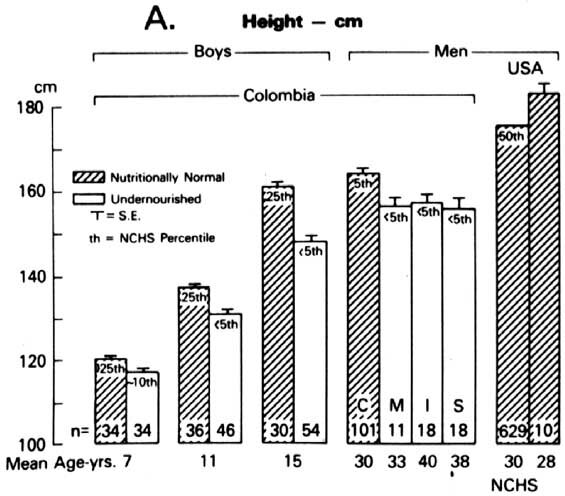 Consequently, the selection process resulted in the separation of undernourished boys, who were smaller and thinner, from normal boys, who were following an essentially normal growth development when compared to either national or international (NCHS; Figure 6) norms. However, the physiologic data (slowed growth velocity, delayed sexual maturation and high circulating growth hormone concentrations) make it clear that the reason for their smallness and thinness is that they are undergoing a process of chronic malnutrition which is no doubt "marginal" in nature but nevertheless real. Furthermore, the fact that there is a progressive deviation from predicted values of height- and weight-for-age from younger to older boys (Figure 6; SPURR, REINA and BARAC-NIETO, 1983) indicates that the process is accumulative with age. Figure 7 is a summary of the anthropometric and work capacity characteristics of our adult and school-aged male subjects studied over the past 15 years. We have demonstrated (BARAC-NIETO, SPURR and REINA, 1984) that the empirical equations developed by PARÍZKOVÁ (1961) for estimating body fat from skinfolds in children also apply to our boys. The results of average estimates of LBM derived from these equations are plotted in Figure 7 (Panel C) together with values for height and weight for the 6-8, 10-12 and 1416 year old boys (Panel A and B) to compare with similar values for the four groups of adult Colombian men discussed previously (C, M, I and S) and a group of 10 nutritionally normal North American men. The LBM of the C group were calculated from the skinfold equations of PASCALE et al. (1956) and that of the American men from those of DURNIN and WOMERSLEY (1974). 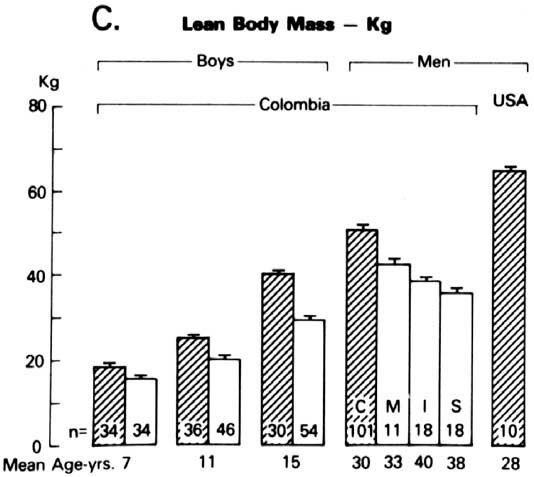 The LBM of the three groups of malnourished Colombian men (M, I and S) were obtained from measurements of total body water (BARAC-NIETO et al., 1978). Figure 6. Average values of height and weight of control and undernourished school-aged Colombian boys plotted as a function of average group ages on NCHS percentiles (SPURR et al., 1983). The development of LBM (Figure 7C) of the undernourished boys is significantly attenuated during growth (BARAC-NIETO, SPURR and REINA, 1984). When expressed as percent of body weight, the undernourished boys had significantly higher values of LBM than well-nourished subjects because of lower fat values in the former (BARAC-NIETO, SPURR and REINA, 1984). 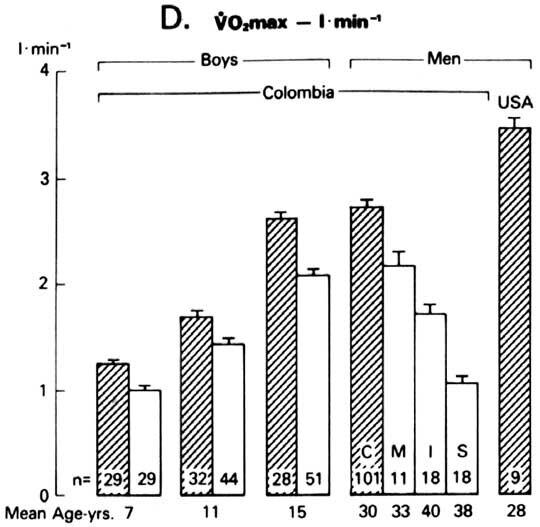 The growth of VO2 max (L/min) in the youngest, oldest and middle of the age groups of boys presented in Figure 6 is shown in Figure 7D. The VO2 max of the nutritionally deprived boys was significantly lower (< 85%) than that of the the normal subjects throughout the age range studied (SPURR et al., 1983). 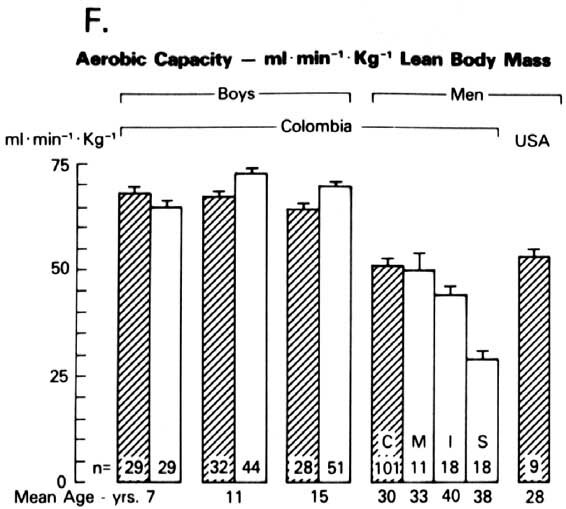 When expressed as mL/min/kg body weight, the two oldest groups of undernourished boys had higher aerobic capacities than the normal boys (Figure 7E) which, at first, was thought to be due to differences in body composition (SPURR et al., 1983). Subsequent studies (BARAC-NIETO, SPURR and REINA, 1984) demonstrated that, even when expressed in terms of LBM, the aerobic capacity of the undernourished subjects, at least in the older age groups, was significantly higher (Figure 7F); that is, the undernourished boys show evidence of better physical condition. These were boys living in the city of Cali. 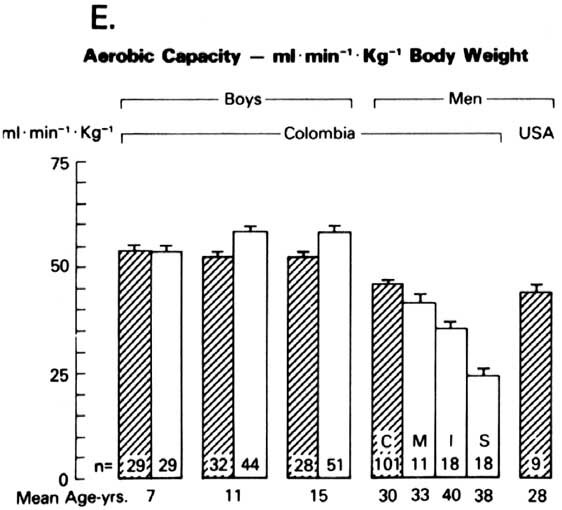 In a similar study on rural Colombian boys, while the difference in aerobic capacity between nutritionally normal and undernourished subjects expressed per kg of body weight was similar to that found for urban subjects (Figure 7E) (SPURR, 1983), the difference disappeared when aerobic capacity was calculated in terms of LBM (Figure 7F), i.e., the rural boys did not exhibit a training effect (BARAC-NIETO, SPURR and REINA, 1984). These results may be due to a relative increase in the daily physical activity of the undernourished boys (in relation to their lower total VO2 maxi SPURR, REINA and BARAC-NIETO, 1986) or the result of greater access of urban children to sports training facilities than rural boys (SPURR et al., 1984; BARAC-NIETO and REINA, 1984; SHEPARD et al., 1974). These results make it clear that the lower values of VO2 max (L/min) for the nutritionally deprived children are due to their lower body weights. Essentially the same conclusion was reached by DAVIES (1973) and SATYANARAYANA et al. (1979). As with adults, there does not appear to be any basic deficit in muscle function in marginally malnourished children, only in the quantity of muscle available for maximal work. We have deliberately avoided analyzing these data on the basis of so-called "developmental" age because such an analysis would tend to obscure the differences seen in Figure 7D; the responsibilities of adulthood occur with chronological, not developmental, age. Figure 7. Body composition and maximum work capacity of normal and undernourished Colombian school-aged boys and adult agricultural workers classified as nutritionally normal control subjects (C), or as mild (M), intermediate (I) and severe (S) in the degree of their nutritional deprivation. Also shown are the values for a group of North American men and U.S. NCHS 50th percentile values of weight and height for adult men. Persons of larger size in general appear to function better than those with smaller stature (CALLOWAY, 1982) in relation to reproduction (THOMSON, 1980), disease (REDDY et al., 1976), cognition (KLEIN, 1972), and work performance (SPURR, 1983; 1984). Because physical work capacity is a function of body size (ÅSTRAND and RODAHL, 1970), i.e., the mass of muscle tissue involved in the maximum effort, and muscle constitutes about 40% of the body weight and 50% of the LBM (CLARYS, MARTIN and DRINKWATER, 1984; BUSKIRK and MENDEZ, 1985), it is interesting to note the correlations between three components of body size and VO2 max presented in Table 3. The correlations in boys are higher than those in men, probably because of a threefold greater range in values, but in either case it is clear that in non-obese subjects there are significant correlations between parameters of body size and PWC as measured by VO2 max. Taller individuals have more LBM and higher VO2 max values (Figure 7). Similar relationships exist for adult women, but the correlation coefficients are lower (VON DÖBELN, 1956). All of the data presented in Figure 7 are from various studies in our laboratory (BARAC-NIETO et al., 1978; 1979; 1980; SPURR et al., 1975; 1977; 1983; 1984; SPURR et REINA, 1986) and permit a comparison between Colombian boys and men, and between the latter and a small group of North American adult males. 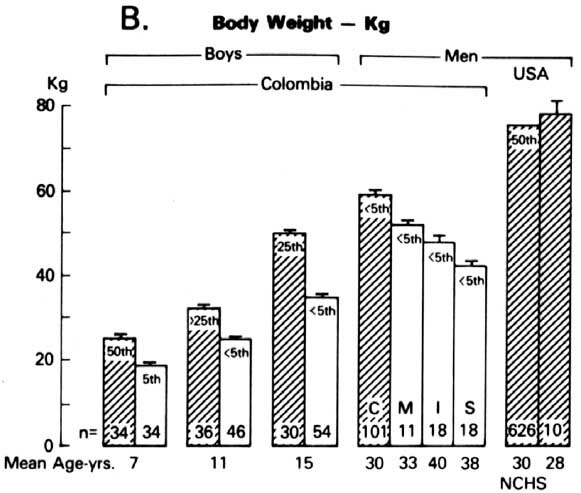 The differences in height between adults of developing and developed countries are well known (Interdepartmental Committee on Nutrition for National Defense, 1963; SPURR, BARAC-NIETO and MAKSUD, 1978; Figure 1). The average value of the C group of men in Figure 7 is very close to that published for low-income Colombian men (Figure 1) and probably reflects some period(s) of undernutrition during the period of growth. The heights of the three groups of malnourished (M, I and S) men were not significantly different from each other but were lower than the C group. This is probably a result of more severe nutritional deprivation in Groups M, I and S during growth than occurred in Group C. It is difficult to predict the adult height of the oldest boys, but it is likely that the nutritionally normal children will be taller (Figure 7A) and perhaps have a higher VO2 max (L/min) than Group C (Figure 7D), while the undernourished group of boys in adulthood will most likely resemble more closely Group M.
Table 3. Correlation coefficients of weight, height, lean body mass (LBM) and maximal oxygen consumption VO2 maxi L/min) in nutritionally normal boys 6-16 years of age (SPURR et al., 1983; BARAC-NIETO et al., 1984) and adult males (BARAC-NIETO et al., 1978). All are statistically significant (p< 0.01). The lower values of aerobic capacity per kg of body weight and of LBM in adults than in boys is also well known and, at least in part, this probably reflects the progressive decline in these measurements with age from the youngest ages (DEHN and BRUCE, 1972). The differences also may reflect differences in the states of physical training in the boys and men.